What makes Bogotá one of the most innovative cities in Latin America? I’m writing this post as I fly back to Chicago from Quito, the capital of Ecuador. I spent the past few days with the city’s Mayor and some of his leaders and teams. They are participating in the Bloomberg Harvard City Leadership Initiative, a partnership between Bloomberg Philanthropies and Harvard University to provide executive education for mayors and senior city leaders, through work on impactful projects. Quito is one of 40 cities participating in this program this year, and one of 13 that have selected Innovation as their area of focus. Reflecting on the work I did with Quito over the past few days, I’m reminded of some of the innovation work that Bloomberg Philanthropies has done with Latin American cities in the past. For example, the Mayors Challenge – one of Bloomberg Philanthropies’ flagship programs in city innovation – had a Latin American focus in 2016. Out of nearly 300 cities in the region that submitted ideas, 20 were picked as finalists and 5 were final award winners. Out of these 5 winners, two cities are in Colombia: Bogotá and Medellín. There is something to be said about the drive of Colombian cities to innovate. For example, Medellín was named the most innovative city in the world in a study conducted by the Urban Land Institute and sponsored by Citi and Wall Street Journal in 2013. And Bogotá’s current Mayor, Enrique Peñalosa, is internationally recognized for his bold and out-of-the-box vision for the city. We recently had the opportunity to speak with Carolina Avila Morales, the leader of Kids First, a project sponsored by Bloomberg Philanthropies in Bogotá through the 2016 Mayors Challenge. In this post we share some highlights from this conversation. 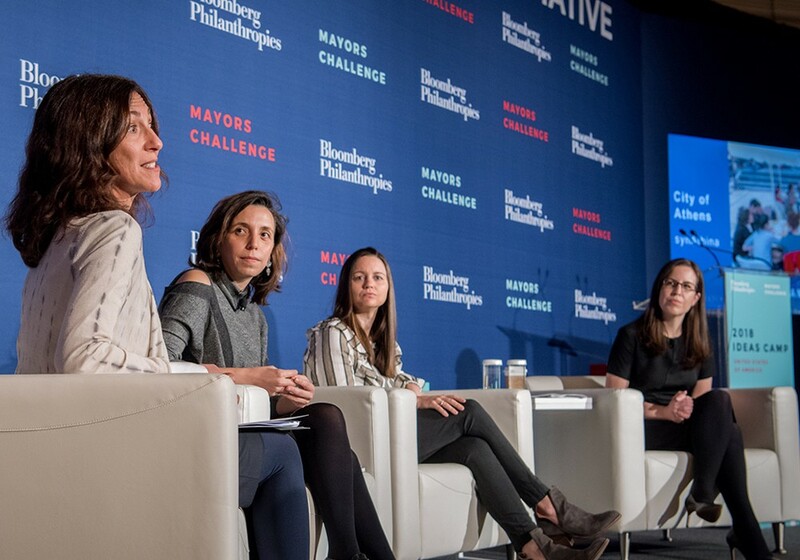 Carolina Avila Morales (second from left), from the City of Bogotá, during a panel discussion at the Ideas Camp organized by Bloomberg Philanthropies in March 2018. Can you tell us more about the idea that you are implementing through the Bloomberg Philanthropies Mayors Challenge in Bogotá? Our topic is how children commute to school. 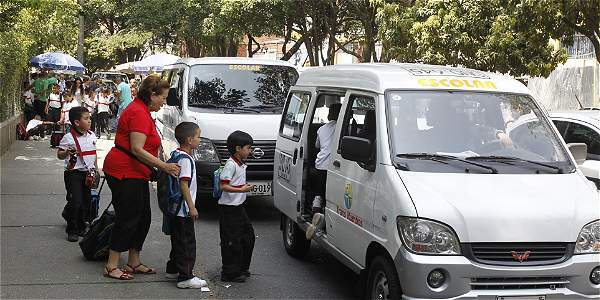 Bogotá is a very big city and most kids don’t go to school in their neighborhoods. Parents in middle and upper classes usually choose the school where they want to send their kids, and many of these schools are located far from where they live so the drive time can be upwards of two hours in a very bad traffic jam. On the other hand, kids from lower income families usually go to school in their neighborhood. They can walk to school but in many areas this poses a risk to their personal safety. So the goal of our project is to improve this commute. For the kids who have to go far, it is about helping to get them get there faster through traffic management strategies and transit policies. And for the kids that walk to school, the idea is to turn the commute into a safe and fun time of play and learning. What are some of the contributions that the Mayors Challenge has made to the city of Bogotá as one of the winners amongst nearly 300 submissions? Bloomberg Philanthropies is looking for bold ideas that solve problems that are shared with other cities. Usually governments don’t have te resources or the mindset to test these bold solutions, and to me that is their main contribution. Having the permission, time and resources to test these ideas, and continuously iterate without the bureaucracy and heavy processes that are common in government. We also receive great support from Bloomberg’s global network, which allows us to learn lots from other cities. Especially because we get to have conversations that otherwise we wouldn’t have. Another significant contribution, for us as Colombians, is that international projects like the Bloomberg Mayors Challenge give us the opportunity to change the perception that people have of us in other countries. This is a really big part of why we want to do our trans:form:ed program in Bogotá because the country is going through this moment of reinvention of identity, especially in the face of people outside of the country. All the labels that were associated to Colombia and Colombians for decades are being eliminated, so new labels have to be created in their place. You are right, a good friend of mine from Israel used to say that innovating in other countries is much easier, but innovating in Colombia is very hard. Because other countries have everything in them, while in Colombia we don’t. So we have to develop new mindsets to solve new problems. You are also working under the leadership of Mayor Enrique Peñalosa, who has served as Mayor before and has been recognized as a very progressive Mayor internationally. What are some of the things you have learned about his leadership style? There’s something about Mayor Peñalosa, which is that when he thinks that something is right, then he goes for it. Something very interesting about him is that he is very popular outside of the country, whereas he receives a lot of criticism inside the country. He has a different view of what Bogotá can be. The bike lane system is a good example: Even though we don’t have a very good public transportation system, he doesn’t stress out over figuring how to solve for what is currently in place and instead thinks of alternatives, like making the city more bike friendly. He has a very interesting view of the city of the future and how it should be. I would say he has guts to do things that are different from what the citizens are used to or asking for. His ideas are not about referendums and doing what people ask for in the short-term and instead thinking about what the city needs in the future. I agree, and to be truly innovative you have to have vision. As is often the case, the people who are leading are alone amongst many people who don’t share their vision, which is what makes it so hard to innovate, because they often find so much resistance. You used to lead an innovation and entrepreneurship center at a university before going to work for the city. We would love to get your perspective regarding how Colombians – big companies and startups – innovate. We are seeing interesting financing models, for example private-public partnerships, which are not as common in the US. There are a few startups that think differently, but not all of them. There is a lot of hype around incubating and accelerating startups. In government there was a huge push when Juan Manuel Santos first became President and launched iNNpulsa (the central government’s innovation agency). Two very good things happened after iNNpulsa was launched: First, the rest of the world started to see Colombia as an innovative country. Second, Colombians developed the interest and confidence to start working on their ideas. We saw startups popping up, then corporations started to notice and they realized that there were things they needed to do differently because even though many of them were already investing in innovation, they began to see small businesses as either a threat or as a potential business partner. This was never the case before. Can you talk about your role being a female leader in Colombia? Being a woman raises a lot of questions about what you are doing or not doing with your life. You do see a lot of women in positions of leadership and entrepreneurs. But most of the female entrepreneurs have smaller businesses, not what I would call pushing innovation. The mindset still tends to be that if you are a woman and you own a business, it is because you want to do something on the side while you care for your children. But of course we also see amazing women doing amazing projects, many of them are working on social impact projects. I wouldn’t say it’s hard being a female innovator or entrepreneur, it just raises questions but that doesn’t mean it can’t be done. It’s interesting because thinking social impact doesn’t mean charity work, it can be social impact with a business goal. I think that the social sector here is changing a lot. Philanthropy hasn’t been historically strong here. But we are seeing more organizations doing social impact or social entrepreneurship. Of course, a lot of that is being promoted by and through government, like the project I’m doing with Bloomberg Philanthropies. But there are now a lot of programs supporting social entrepreneurship here, both big and small. Many of the incubators and accelerators, for example, are focused on the peace and reintegration process, and trying to create new socially minded businesses around this topic. These projects are still not big enough, they tend to have very small impact which makes them hard to replicate or scale. They are very different from examples like Rappi, which has received a lot of investment and has expanded to other countries in Latin America. Startups like Rappi, which aren’t created for social impact but do make an impact, grow much more rapidly than those that are born with the specific purpose of creating social impact. We have seen back and forth changes in regulation for mining, oil and gas, which have been for a long time the main sources of foreign investment in Colombia. Then there is the idea of redistribution of land to promote agriculture as a means for re-integration of former guerrilla members. More recently there has been a lot of talk about promoting the ‘orange economy’ or creative entrepreneurship. What opportunities do you think exist for outside investors in the aftermath of the peace process? This is hard to answer because President Duque and his cabinet are still fairly new. Of course there are great opportunities in the agricultural sector through fair trade, improving the conditions for farmers and ensuring they maximize their earnings by realizing more of the value chain, but that is yet to be sorted out. I know there are lots of investment funds here looking for opportunities in this space. For example, Acumen is actively looking for these types of projects but there aren’t many yet. Another example is Agruppa, launched by a woman by the name of Carolina Medina. It was a very interesting project to help farmers, it got lots of investment, but she eventually had to shut it down. Anything that has to do with re-integration of the former guerrilla members presents an opportunity. Also, as Colombians we have to work on our mindset and create the opportunities because, at the end of the day, the reintegrated guerrilla members need work and business leaders and entrepreneurs have the responsibility to help close this gap. I come back to Rappi, the example I shared before, because they create work that pays better than what their couriers would make if they had a minimum wage job. For example, you see many refugees from Venezuela who are working as Rappi couriers and who otherwise may not have found jobs here. What final thoughts do you have regarding opportunities in Colombia? There is a huge opportunity here in the education space, we are not doing enough to prepare our children and leaders for the future. And programs like trans:form:ed are great examples for how to close these gaps. trans:form:ed is a peer-based, cultural immersion that exposes leaders to new innovation models; providing the ideal conditions for deep reflection, strategy development, and partnership cultivation.